Enderby played a pivotal role in the early development of the Okanagan Valley. Situated on the west bank of the Spallumcheen or Shuswap River, it is located at a point where the river changes its westerly flow to a northerly direction, emptying into Mara Lake. It was in the vicinity of this river that the Spallumcheen tribe of the Shuswap Indians lived for hundreds of years, hunting and fishing along its banks. And it was just south of the town site that Alexander Leslie Fortune, an Overlander, preempted land in 1866, thus becoming the first white settler in the North Okanagan. The bend in the river made an ideal stopping spot for steamboats from Kamloops shipping supplies to settlers in the South Okanagan. It was from this point that goods could be transshipped to the head of Okanagan Lake, a distance of twenty miles. By the late 1870's there was regular steamboat service between Fortune's Landing and Savona or Kamloops. Recognizing the importance of the river, Thomas and Robert Lambly preempted 320 acres to the east and north of the Spallumcheen Band Reserve in 1876. They built a long warehouse and a hotel near the riverbank The site became known as Lambly's Landing or Steamboat Landing. 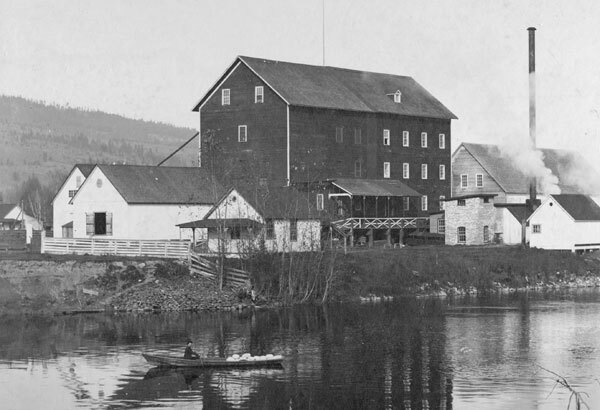 In 1887 a five-story roller mill was established on the banks of the river, designed to mill the large acreage of wheat being grown on ranches to the south of Enderby. The flour was shipped by paddle wheeler to the mainline in Sicamous, a rather unreliable transport in the fall and winter. R.P. 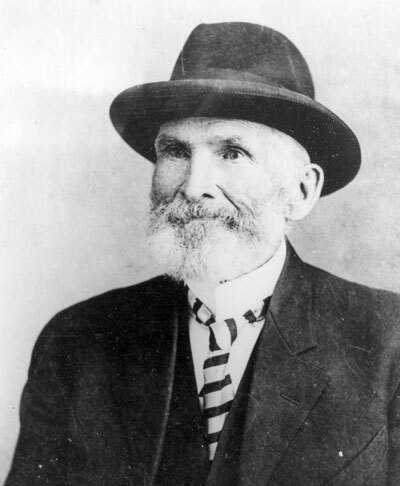 Rithet, owner of the flour mill, and Moses Lumby, owner of a large ranch to the south, became major shareholders in a company proposing to build a railroad line connecting Okanagan Landing with the mainline in Sicamous. It seemed clear that the railway was coming, and the little settlement on the river would be the hub of construction. A post office was slated to open in Mr. Harvey's General Store. But what name would appear on the post mark? Would it be Steamboat Landing or Lambly's Landing or Belvedere? At a literary gathering at Mrs. Lawes' home, a group of women became excited by a Jean Ingelow poem about a rising tide of water. The villagers were saved by the chiming of church bells playing the tune "The Brides of Enderby". When the post office opened that fall, many local residents were surprised that they now lived in Enderby. With the completion of the Shuswap and Okanagan Railroad in 1892, the small town of Enderby on the banks of the Shuswap River began to grow and prosper. The Columbia Flour mill expanded, and became the first flour mill in British Columbia to export flour to the Fiji Islands and Japan. 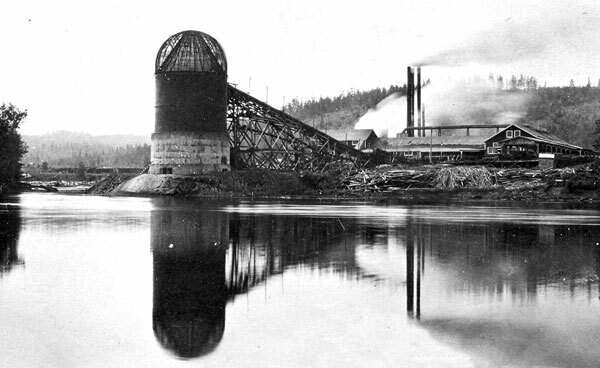 Smith and McLeod located a large sawmill on the river, cutting timber from as far away as Mabel Lake and running down the Shuswap River to the mill in the spring. And Andy Baird began to operate and expand a brickyard, utilizing the excellent quality clay found along the banks of the river. By 1905 the business district had expanded along Cliff Street, adding another hotel, the King Edward, another blacksmith shop, several general stores and restaurants, a butcher's shop, a livery barn, a jewelry store, and newspaper office. The community was served by one doctor, three churches, a public school, and a bank. With the population of 500 and growing, the townspeople decided to incorporate. 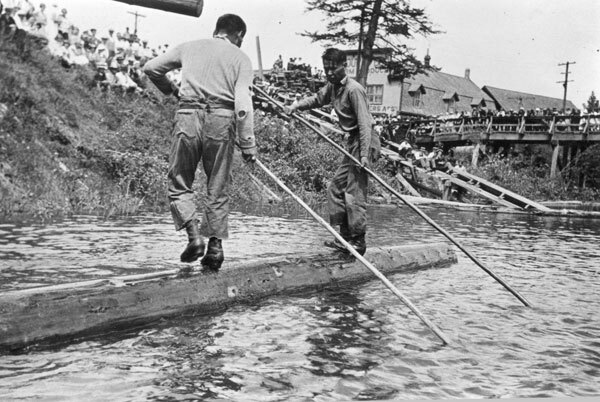 Water was brought to the new city from Brash Creek, and the sawmill proved electricity. Enderby became well-known for its famous May 24th celebrations, with people travelling on paddle wheelers and the train to join in the events. The morning was filled with water sports, including log rolling, canoe races, and greasy pole. In the afternoon baseball and lacrosse teams battled with the children were kept busy with a parade, races and games in the recreation grounds. The events culminated with a grand ball in the evening. World War I and the post-war depression marked an end to this glorious economic boom. The flour mill closed in 1914, when it couldn't compete with prairie wheat. The sawmill closed in 1922, when the prairie market began to slump. The brickyard closed in 1939 when its labour force went to war. During the 1930s farmers switched to mixed farming and particularly dairy cattle. 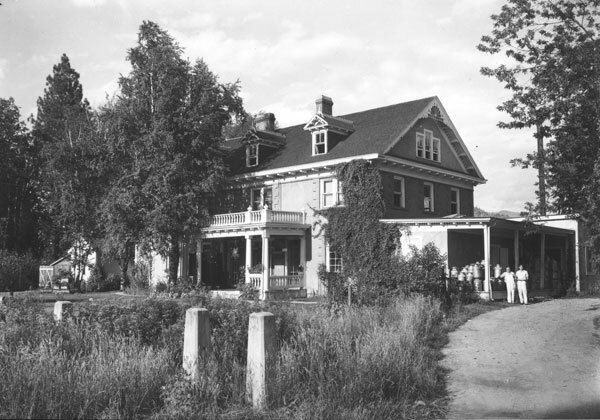 A creamery opened in the former flour mill manager's home, and by 1934 the Enderby Creamery was winning numerous B.C. and Canadian awards for its high quality butter. The pole industry maintained a slow growth throughout this period by selling cedar poles to the prairies and the east. By the end of World War II, Enderby began to share in the general post-war boom that affected much of North America. Three large sawmills and two more poleyards established their operations along the banks of the Shuswap River and continued to use the river as a method of transporting logs from Mabel Lake. With the introduction of rural electrification and milking machines, farmers switched from the Jersey cow to the more prolific Holstein, and the cream check was replaced by a milk quota. Fruit farming continued to ebb and flow as it had in the past, while large poultry, beef, and hog farms were established and alfalfa hay provided a bonus crop. Today much of the logging and mill activity has subsided, while secondary manufacturing of wood products is on the rise. The dairy and livestock industries continue to thrive, and are further enhanced with the introduction of exotic animals such as ostriches, fallow deer, bison, and llamas. The Shuswap River has retained its importance as a navigable river, but canoeists and kayakers have taken the place of steamboats. The river now links the small developed communities in the rural district, from Kingfisher and Ashton Creek in the east to Springbend, North Enderby, Grindrod, and Mara in the north. And the City of Enderby remains the centre of services for the rural area.